This compound acts as an antioxidant, however, only when there is an excess of it and it is in the "free" state in the cells. But there is little free ALA circulating in your body, unless you consume supplements or get it injected. Foods contain only tiny amounts of it. What makes ALA special as an antioxidant is its versatility; it helps deactivate an unusually wide array of cell-damaging free radicals in many bodily systems. In particular, ALA helps protect the mitochondria and the genetic material, DNA. As we age, mitochondrial function is impaired, and it is theorized that this may be an important contributor to some of the adverse effects of aging. ALA also works closely with vitamin C and E and some other antioxidants, "recycling" them and thus making them much more effective. As mentioned earlier, ALA plays a large role as an anti-oxidant. It is such a powerful antioxidant that some researches have dubbed it the "universal antioxidant." Through studies, ALA has shown that it works in conjunction with vitamins C and E, to help improve their effectiveness in combating free radicals, as mentioned earlier . Research has even shown that ALA can actually replace the function of vitamin C in animals deficient in vitamin C . This is especially important to bodybuilders because intense physical activity such as weight training or extreme cardio can cause extreme oxidative damage, letting loose many free radicals in the body. That is why antioxidants, both natural and supplemental, are critical to bodybuilders. 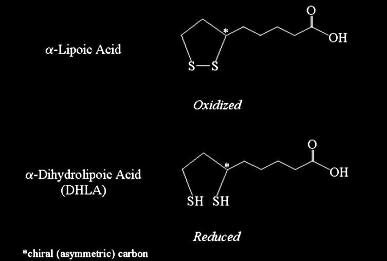 Then in a chemical reaction the free radical is eventually passed off to lipoic acid or glutathione molecule, which allows the original antioxidant to regenerates and neutralize more free radicals while ALA washes out the offending free radical . Glutathione, ALA&apos;s wingman in this disposal process, is also a critical antioxidant. Alpha Lipoic Acid supplementation has been shown to boost glutathione levels, which drop significantly during periods of exercise induced stress by up to 50% . A test was conducted to determine ALA&apos;s association with insulin sensitivity. In type II diabetes, elevated blood glucose levels result from insulin resistance rather than a lack of insulin, and a number of treatments have been aimed at improving insulin sensitivity. There is limited evidence that high doses of alpha-lipoic acid can improve insulin sensitivity in individuals with type II diabetes. ALA is being studied in animals and in humans as a preventive and/or treatment for many age-related diseases. These range from heart disease and stroke to diabetes and Parkinson&apos;s and Alzheimer&apos;s disease, as well as declines in energy, muscle strength, brain function, and immunity. It is also being studied for HIV disease and multiple sclerosis. In Germany, in particular, it is already prescribed to treat long-term complications of diabetes, such as nerve damage, thought to result in part from free-radical damage; there is also evidence that it can help decrease insulin resistance and thus help control blood sugar.